Goldman looks at the change in private inventories (also called "inventory investment") as a good predictor of GDP growth. 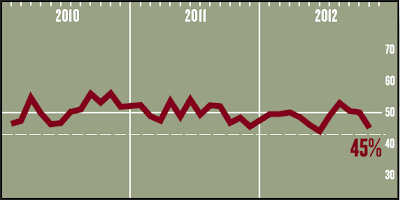 The Q3 GDP exhibited relatively strong inventory accumulation, which is being reversed this quarter (as the charts above show). 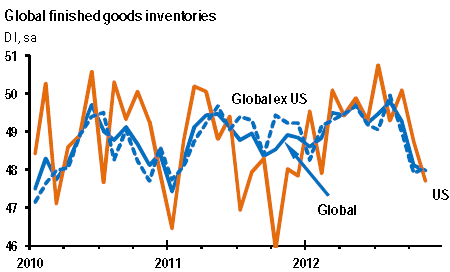 GS: - Inventory investment is often an important contributor to quarterly fluctuations in real GDP. Most recently, real GDP growth in Q3 saw a sizable boost from inventory accumulation. ... Given the soft early indicators from business sentiment surveys to date, and our own econometric analysis, we expect that the boost to GDP growth from inventory investment seen last quarter will not persist into Q4. Inventories will probably be a moderate drag on GDP growth into year-end. The recent decline in the series is consistent with a moderation in inventory investment in the current quarter, and hence a decline in the contribution from inventory investment to real GDP growth. A simple regression of quarterly inventory investment on our indicator [R-squared = 0.8] suggests that inventory accumulation could fall by $34 billion in Q4 ($135 billion at an annual rate) to $27 billion, enough to detract roughly a full percentage point from Q4 real GDP growth if taken at face value. This reduction of inventories (which to a large extent is driven by the impasse in Washington) resulted in Goldman's downgrade for Q4 GDP forecast to 1% (annualized rate). What makes this anemic growth projection particularly painful is that it is likely caused (see discussion) by a political gridlock over issues that have been well telegraphed for quite some time (see discussion). The irresponsible behavior of politicians is not surprising, but sad nevertheless.